Alberto Burri (1915-1995) is a towering figure of abstraction whose work revolutionised the artistic vocabulary of the post-war art world. 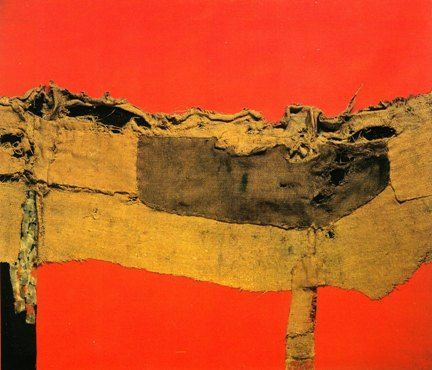 Burri's celebration of humble materials such as sacking and tar created a new aesthetic rich in expressive power during the 1950s, and was later to prove decisive for artists associated with the Arte Povera movement. Yet, despite his stature, Alberto Burri: Form and Matter at the Estorick Collection of Modern Italian Art from 13 January to 7 April 2012 is the first major retrospective exhibition of the artist's work to be held in the United Kingdom. It offers a comprehensive overview of Burri's achievement through some forty powerful works spanning four decades, ranging from rare, early figurative pieces of the late 1940s to the ground-breaking abstract works for which he is best known. Burri was born in Città Â di Castello, in Italy's central Umbria region. Originally trained in medicine, he served as a doctor in North Africa during the Second World War, but was taken prisoner in 1943 and interned in a prisoner-of-war camp in Hereford, Texas, for the remainder of the conflict. It was here that Burri first began to paint. Returning to Italy in 1946 he was awarded his first solo exhibition in 1947 at Rome's La Margherita gallery, displaying works created in a style strongly informed by Expressionism, such as Procession of the Dead Christ. The current exhibition includes a number of works dating from this early period, including The Stall, Fishing at Fano and Upper Piazza, all dating from 1947. In addition to a large number of signature pieces from the key period 1950 to 1980, the exhibition will also include several fascinating examples of works created in a range of media and techniques perhaps less commonly associated with the artist, including a series of rare and elegant prints. Curated by the art historian Massimo Duranti, it represents a long overdue reconsideration of one of the undisputed masters of the 20th century. The exhibition has been organised under the patronage of Fondazione Palazzo Albizzini in Città Â di Castello  the largest repository of Burri's works, bequeathed by the artist to his hometown  and draws on a number of important public and private collections in Italy and the United Kingdom, including Tate Modern, the Musei Vaticani and the Galleria Nazionale d'Arte Moderna, Rome. The evolution of Burri's work was rapid. Quickly abandoning his figurative style, he began to explore abstraction in vibrant yet delicate works inspired by artists such as Paul Klee. Between 1948 and 1950, he was to develop a revolutionary approach to image-making grounded in a poetic exploration of matter that challenged the two-dimensional nature of the wall-mounted artwork  an interest that he continued to expand and refine over the course of a long and fruitful career. Initially explored in terms of the varying textures of paint, this preoccupation swiftly led him to engage with and incorporate a wide variety of materials into his works, ranging from tar to pumice stone and, most famously, sacking.